If you've seen the 1975 film "Jaws," then you might think that a little New England town called Amity Island is the most dangerous place for shark attacks. The idyllic and quaint resort town became a place of horror, as screaming filled the air and blood turned the ocean red. It seemed like it would never be safe to go back into the water. Even the boat of movie stars that saved the day in the first film couldn't stop the sharks from returning in the sequels. While Amity Island isn't a real place, the events of the movie and book were likely based on some real-life attacks that occurred in 1916. In just 12 days, a shark killed four people and mauled seven others along the coast of New Jersey. People were in a panic; just a year earlier, the New York Times had said that sharks didn't seem to be dangerous in U.S. waters [source: McCall]. In the absence of Roy Schneider and Richard Dreyfuss, U.S. President Woodrow Wilson had to handle the crisis. Wilson held special meetings with his Cabinet and dispatched the U.S. Navy and the U.S. Coast Guard to get rid of these menaces of the sea. The common theme in both of these stories is the element of the unexpected and the unknown. Part of why shark attacks scare us so badly is that one minute you're minding your own business, swimming along, and the next minute, you've lost a leg. But we know a lot more today about where sharks live than we did in 1916, so we can give you an idea of where you might want to be a little more careful about sharks. So before you load up the car for a beach trip, take a look at this list of places that rank high for shark attacks. That's not to say you shouldn't go. After all, shark attacks are rare, with only 88 and five fatalities occurring worldwide in 2017 [source: Pulver]. You should probably worry more about rip tides, jellyfish and car accidents than unexpectedly meeting one of these fearsome fish. But it's definitely worth reviewing the tips to avoid a shark attack before swimming at any of these 10 spots. So cue up the "Jaws" music and turn the page to find out where people actually call the sharks to their shores. The statistics in this article come from the International Shark Attack File (ISAF), which maintains data on all known shark attacks. The ISAF is administered by the American Elasmobranch Society and the Florida Museum of Natural History and has data on shark attacks going all the way back to the mid-1500s. The ISAF doesn't list shark fatalities per nation, state or province, only on a global basis. Typically, the world sees about six fatalities each year [source: Florida Museum]. Papua New Guinea is the eastern half of the island of New Guinea, the world's largest tropical island [source: FAO]. Located in the Pacific Ocean, Papua New Guinea has logged 48 shark attacks since 1848 [source: ISAF]. That's more than New Zealand, which has seen 39 attacks since 1852 [source: ISAF]. However, New Zealand has 9,404 miles (15,134 kilometers) of shoreline, while Papua New Guinea has but 3,201 miles (5,152 kilometers) of coast. The waters of Papua New Guinea contain a wide array of marine environments, so divers from all over the world come to the island to see the immense variety of aquatic life, with shark dives one of the popular options. It's not clear if Papua New Guinea's shark attacks stem from divers and other tourists, or if the attacks stem from the local habit of fishing for sharks. More traditional means of fishing still exist here as well, and reflect the fact that sharks have always been a part of the natives' lives. Some residents of Papua New Guinea, particularly in the province of New Ireland, still practice an ancient art called shark calling. Shark callers claim to commune with shark spirits, drawing them near through ritual songs and prayers. When the shark comes to the boat, the caller places a noose on it, clubs it and takes it home for the villagers to eat [source: Jensen]. Since 1837, 102 shark attacks have occurred in South Carolina [source: ISAF]. Though they occur all along the state's coastline, the majority have occurred in Horry County, home to popular Myrtle Beach. As this list will reveal, more people in the water generally increases the chance of a shark attack. Some 12 species of sharks have been detected in South Carolina's waters [source: South Carolina Department of Natural Resources]. The species are generally mild, including the sandbar and bonnethead sharks, but more aggressive species, including the tiger and the bull shark have been spotted. South Carolina's offshore estuaries provide good birthing and feeding grounds for these sharks. Several factors keep South Carolina from being as dangerous a place as, say, Florida. At North Myrtle Beach, the continental shelf, where sharks find many fish to feast on, is located 50 miles (80.5 kilometers) out from the coastline. In Florida, that shelf can come within a mile of the shore [source: MyrtleBeach.com]. We'll have much more on Florida later, but as another comparison, the waves are generally milder at beaches such as Myrtle Beach, so fish aren't being thrown inshore with sharks in hot pursuit. It should be noted that escaping to the other Carolina won't eliminate the threat of sharks. North Carolina is no slouch in the shark attack department either, with 64 attacks [source: ISAF]. When you look at the whole continent of South America, 125 attacks have occurred since 1931 [source: ISAF]. But look closer, and you'll see that 104 of those attacks have occurred just in Brazil [source: ISAF]. What's bringing all these sharks to Brazil? A beach town named Recife, which has had some unfortunate luck in attracting sharks to its coastline. The trouble started in the 1980s, when Porto Suape was constructed to the south of Recife. The construction sealed off two freshwater estuaries, which had served as the birthing waters for many bull sharks. When the estuaries were closed, the sharks went to the next estuary, which happens to discharge right into Recife's waters. A nearby channel used by surfers became these sharks' new feeding grounds. The sharks may have been driven even closer to Recife's shore by a slaughterhouse, which was disposing of blood in nearby tributaries. Since these events, Recife's 12.5-mile (20-kilometer) coastline has become an extremely dangerous place, with a higher proportion of attacks resulting in death. One in three shark attacks that occur in Recife are fatal [source: Kingstone]. When Dave Martin was mauled to death by a shark in San Diego in 2008, it surprised some shark researchers. Since 1926, San Diego has had only had 18 attacks [source: ISAF]. Shark attacks in California are much more likely to occur farther north, in the infamous Red Triangle. About 90 miles (145 kilometers) of Northern California coastline between Point Reyes and Monterey Bay form one side of the Red Triangle; from those two points, lines extend to meet just past the Farallon Islands, to the west of San Francisco. These waters are home to lots of seals, which in turn attract lots of great white sharks. The state of Florida has so many shark attacks -- 244 from 2007 to 2017 alone — it warrants two spots on this list [source: ISAF]. Our first entry is Brevard County, where 144 attacks have occurred since 1882 [source: ISAF]. One reason Florida has a lot of shark attacks is that it has a lot of tourists eager to get into the water, and Brevard County is an easy hour-long drive for those already in the area to see Mickey at Disney World in Orlando. The county is home to the famed "Space Coast," 70 miles (113 kilometers) of coastline named for the space center at Cape Canaveral. In addition to the Canaveral National Seashore, visitors can also enjoy Cocoa Beach and Melbourne Beach. While the number of shark attacks is nothing to sneeze at, Brevard County is dangerous for a few other reasons as well. 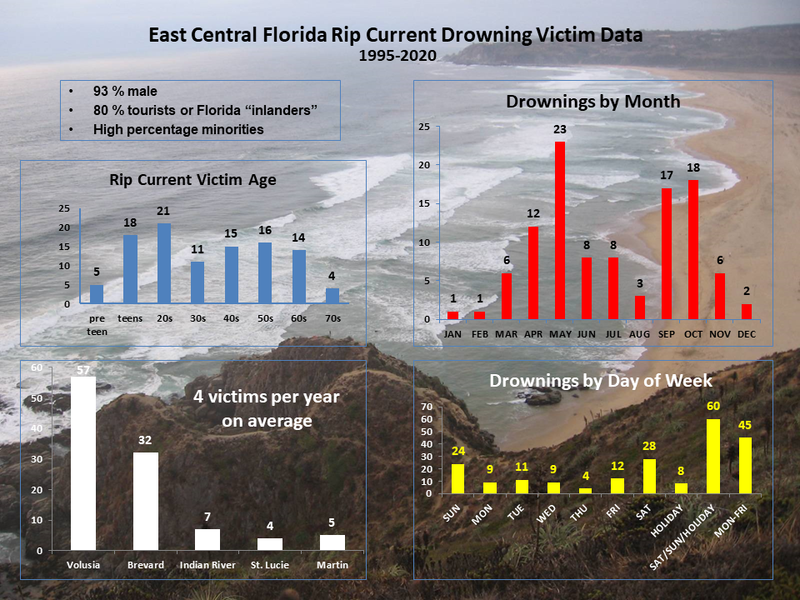 In 2008, Forbes named Brevard County beaches the most dangerous places for rip current drowning. Between 1995 and 2017, 27 people drowned from rip currents in Brevard, a rate that's higher than any other county in the United States but Volusia in Florida (which we'll meet later) [source: Weather.gov]. Parts of this coastline also fall into Florida's "Lightning Alley," an area that has the most lightning in the United States. So when you're not worrying about sharks, worry about the forecast. What's a trip to Hawaii without a stop in Oahu or Maui? Two-thirds of Hawaii's 159 shark attacks since 1828 have occurred off the coasts of these two islands, with 64 attacks occurring in Maui and 42 attacks in Oahu. Other islands aren't safe either, with 28 attacks occurring off Kauai and 19 off the big island of Hawaii [source: ISAF]. This total is fairly low when you consider the millions of tourists who visit each year, but you should still be on the lookout for the approximately 40 species of shark that call Hawaii home [source: Hawaii.gov]. One of these species is the dangerous tiger shark, responsible for the most attacks on humans after the great white. Hawaii has a mixed record when it comes to dealing with sharks. On the one hand, a 1959 fatal attack led to a decades-long shark eradication program sponsored by the government [source: Gaffney]. On the other hand, some native Hawaiians call the tiger shark aumakua, or guardian spirit. In 2006, Sarah Kate Whiley was swimming near Brisbane in water no higher than her waist when she was attacked by three bull sharks, which tore off both of her arms while biting her stomach and legs. Her friends ignored her scream at first, thinking it was a joke. Until they saw blood in the water [source: Chipperfield]. Whiley's death is just one of Queensland's 189 attacks since 1700 [source: ISAF]. Australia is home to 166 shark species [source: Modofsky]. You could run into one of them anywhere on the seaboard, but the eastern coast of this country is particularly prone to attacks because it's so densely populated. Australia's eastern coast is made up of two large states: Queensland and New South Wales. These two states rival each other for the most dangerous coastline in Australia. Between 1917 and 2017, Queensland had 52 shark attack fatalities out of 134 fatalities in Australia [source: Taronga]. Some of Queensland's beaches are protected by drumlines, or baited hooks meant to catch sharks, as well as some protective netting. Nets are designed to catch sharks more than 6.6 feet (2 meters) in length, so that the more dangerous sharks aren't coming in close to shore [source: Queensland Government]. The government must constantly defend the practice to environmentalists, however. In 2005, in response to outcry about a baby humpback whale killed in the nets, the Queensland government released figures relating to the nets' success. In one year, 630 sharks were caught; 298 of those were greater than 6.6 feet (2 meters), including a 17-foot (5.2-meter) tiger shark [source: Murtagh and Mancuso]. Like its neighbor to the north, Queensland, New South Wales along Australia's eastern coast is home to some beautiful beaches, which in turn are home to quite a lot of sharks. New South Wales has seen 238 attacks since 1700 [source: ISAF]. There have been 47 fatalities [source: Taronga]. Some recent attacks have helped this sunny locale rank so high on our list. In 2015, a surfer died after both his legs were bitten off in a shark attack. It was the third fatal attack in New South Wales in 12 months [source: Safi]. Still, New South Wales's numbers have likely been kept low by protective measures taken at beaches near Sydney. In 1937, nets and mesh were installed in the waters, and the program was expanded in the early 1960s after a spate of fatal attacks [source: Mancuso]. As of 2017, 51 beaches were protected by these nets or by drumlines, baited hooks intended to attract the sharks. These have proved controversial as they have caught 98 mostly harmless sharks in the course of a year but also 279 other marine animals, including 166 rays and 10 turtles [source: Knaus]. For these reasons, the environmentalists favor building caged enclosures for swimmers instead. You might think that 251 shark attacks since 1905 would keep folks away from the waters of South Africa, but that doesn't seem to be the case [source: ISAF]. More and more people are flocking to South African waters to dive with sharks. There's plenty of them to find -- South Africa was one of the first countries to formally protect great white sharks, so their populations have grown [source: Hamilton]. You can see mako, ragged tooth, tiger, hammerhead, bull and blacktip sharks, just to name a few. Near Kosi Bay you'll find tenacious bull sharks known locally as Zambezi. Dyer Island, near Capetown, has earned the nickname "Shark Alley" for the many species of sharks in the water, particularly a high number of great white sharks. These great whites spend their time stalking Geyser Rock, home to more than 50,000 seals [source: Cahill]. While shark diving may provide thrills galore, the industry is extremely controversial. Some blame shark diving, a somewhat haphazardly regulated industry, for recent shark attacks, because it encourages sharks to come closer to shore than they normally do [source: Hamilton]. Proponents say it's safe and provides a way to learn more about sharks in their natural environment. One tour guide has claimed that he doesn't even bother with the cage when diving with sharks [source: Shott]. On the flip side, however, another tour guide was injured because his foot was hanging over the side of the boat as he baited the waters to draw the great whites closer [source: Shott]. Chumming the water, or putting a mix of fish blood and guts into the water, could change a shark's natural behavior. With each new attack, some worry that the sight of humans may become linked to the promise of food, increasing the danger for unsuspecting divers who have no food to offer. At the next spot on the list, you don't need to pay to dive with sharks -- they're probably swimming all around you! Find out the most dangerous place for shark attacks on the next page. Volusia County, Florida has had 299 attacks since 1882. [source: ISAF]. That's not only the highest number of shark attacks recorded in Florida, but it's more than South Africa, whose attacks occurred over 2,798 miles (4,503 kilometers) of coastline, as opposed to a single county. Indeed, at New Smyrna Beach, located in Volusia, there are more incidents per square mile than on any other beach in the world [source: Luscombe]. If you've been swimming at New Smyrna, you've probably been within 10 feet (3 meters) of a shark [source: Regenold]. These distinctions have earned New Smyrna Beach the nickname "Shark Attack Capital of the World." Volusia County has been in the top spot for decades. Are the people swimming at New Smyrna Beach particularly delicious? Are the sharks hungrier here? While the area is home to many baitfish, a common prey for these sharks, the real reason for the high number of attacks is simply the number of people in the water. Swimmers and fishermen flock to these waters, and the beaches in this county are some of the most popular in the state for surfing. There can be as many as 300 surfers in the water on a given day [source: Voyles-Pulver]. Being known as the "shark attack capital of the world" doesn't seem to dissuade surfers and swimmers, though. In fact, the deputy beach chief reported in 2001 that when he closed the beaches following shark sightings and attacks, he received angry voice mail messages [source: Canedy]. That may be because attacks in Volusia County are fairly mild and are usually just minor bites. Some shark attack victims even drive themselves to the hospital [sources: Taylor, Eckinger]. Last editorial update on Jul 25, 2018 04:40:35 pm. Commercial fishing nets catch the ocean's fish indiscriminately. HowStuffWorks looks at a simple solution to help save sharks. Capuzzo, Michael. "Relax, Sharks are Picky Eaters." Wall Street Journal. Aug. 31, 2001. Cuadros, Paul. "In shallow waters danger runs deep." Time. Sept. 4, 2000. Eckinger, Helen. "Shark attacks surfer off New Smyrna beach coast." McClatchy - Tribune Business News. Nov. 8, 2007. Essoyan, Susan. "Hawaii Studying Tiger Shark Hunt in Wake of Attacks." Los Angeles Times. May 14, 1992. Kernicky, Kathleen. "Shark Week! Florida Expert wades into scary Brazil waters." Knight Rider Tribune Business News. July 29, 2006. Mancuso, Roberta. "Whale death strengthens case against shark nets." Australian Associated Press. Aug. 5, 2005. Modofsky, Leora. "And while cycling, watch out for Tasmanian devils." Time. April 10, 2000. Murtagh, Caitriona and Roberta Mancuso. "630 sharks in nets a 'killing program.'" Australian Associated Press. Oct. 27, 2005. Taylor, Gary. "3 bitten by sharks in 3 days in Volusia County." McClatchy - Tribune Business News. April 29, 2008.